There are not too many organizations out there that given the chance, would say ‘no’ to improving their overall productivity and safety. It’s an ongoing struggle that requires constant attention, if you’re going to find ways to improve upon them. When given the chance, many managers and safety consultants jump at the opportunity to improve in any way they can. The problem is, they sometimes overlook the small things that have the ability to make drastic changes. So here’s a hint: look down, no literally right below your feet maybe the answer to the next improvement opportunity—floor signs. The overall quality of floor signs has came along way in recent years. They are stronger, brighter, and more impactful than ever. The new materials used to make the signs are extremely durable and the printers used to make them enable the signs to really stand out with bold and vivid colors. Floor signs can provide endless amounts of information. From trying to signal workers towards a specific location, to reminding them to put their PPE on, floor signs have the ability to make a difference in your workplace when strategically placed. Have a unique message, but can’t find the floor sign you need? Not to worry! There are companies out there that offer you the opportunity to design your own floor sign, using the text and graphics you provide. This is a great opportunity for you to provide a unique, impactful message to your employees, without much effort or capitol. Each workplace has its own unique culture. When you can relay messages with your culture and workers in mind, they have the ability to make a much bigger impact. One of the most effective ways to provide employees with critical information, where it’s needed, is with a visual workplace. Lean organizations everywhere have thrived on the visual workplace methodology, but its concepts are quickly spreading out into organizations of all sorts. In a visual workplace, you will find organizations taking advantage of floor signs, posters, floor tape, labels, placards and other markers to provide the information needed to improve their workplace. Visual cues can help keep workers focused, on-task, and provide the type of information that could otherwise be unavailable. But location is key. When you’re installing your floor signs, or other visual cues, it’s important to be strategic about their location. The point of a visual cue is that it provides information where it’s needed most. This keeps employees working without disruption, keeping them as productive as possible. Eliminate Waste- Anytime an employee has to stop what they’re doing to search for information, that is considered waste. Placing information on a visual cue, like a floor sign for example, can help provide valuable information and keep the employee working without disruption. Improved Training- Experts say we gain 75% of what we learn through visual cues and only 13% through our hearing. Using unused/valuable floor space to place critical information with floor signs will help communicate important information and eliminate information deficits. Increased Productivity- When you take the time to design a quality visual workplace, the benefits will spread across your organization. You will see a positive impact on productivity, cost, quality, on-time delivery, inventory and equipment reliability. More importantly, your visual workplace will help sustain the efforts you put in and allow your workplace to continuously improve over time. The most common floor sign seen in the workplace is the STOP sign. This can be used to alert forklift or pedestrian traffic and can be purchased to resemble the common STOP sign seen on the street. This eliminates any confusion as to the meaning of the sign and can help prevent a costly accident. Another common use of a floor sign is to mark the location of an object, like a trashcan for example. Having a place where things go is key to keeping your workplace clean and organized, but if no one knows where things go, it makes it difficult. Use floor signs to mark the locations of movable objects and the confusion is gone. Safety and PPE reminders are also a great use of floor signs. Sometimes even the most mundane activities need reminders, like putting on your safety goggles or gloves for example. Accidents can happen in a blink of an eye. Using floor signs to remind employees about safety and PPE will help keep them safe in the workplace. Installing floor signs around your facility is not only easy to do, but is also inexpensive. The average cost of a quality floor sign is only $15. Considering the life-span is up to 7 years, that’s just about $2 a year, per sign, to get the information to those who need it, when they need it. 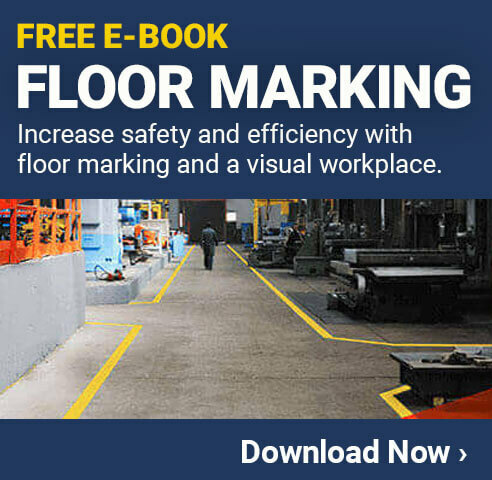 Using visual cues like floor signs around your workplace will help create an environment that is constantly advocating safety and help re-enforce your organization’s values. Remember, the culture you wish to create is dependent upon the environment that surrounds it. So the next time you have a voice in improving productivity or safety in your organization, mention the benefits of floor signs. They can provide the information you need to relay and they look good too!